Patients who have no cardiac history and good functional status do not require preoperative stress testing prior to non-cardiac thoracic surgery. Functional status has been shown to be reliable for prediction of perioperative and long-term cardiac events. In highly functional asymptomatic patients, management is rarely changed by preoperative stress testing. It is therefore appropriate to proceed with the planned surgery without it. Unnecessary stress testing can be harmful because it increases the cost of care and delays treatment without altering surgical or perioperative management in a meaningful way. Furthermore, low-risk patients who undergo preoperative stress testing are more likely to obtain additional invasive testing with risks of complications. Cardiac complications are significant contributors to morbidity and mortality after non-cardiac thoracic surgery, and it is important to identify patients preoperatively who are at risk for these complications. The most valuable tools in this endeavor include a thorough history, physical exam and resting EKG. Cardiac stress testing can be an important adjunct in this evaluation, but it should only be used when clinically indicated. Don’t initiate routine evaluation of carotid artery disease prior to cardiac surgery in the absence of symptoms or other high-risk criteria. Carotid stenosis with symptoms (stroke or transient ischemic attacks [TIA]) is a known risk for cardiovascular accident and appropriate for preoperative testing. The presence of a carotid bruit does not equate to an increased risk of stroke after cardiac surgery. Patients with carotid stenosis have a higher rate of cerebrovascular complications after cardiac surgery, but there is no evidence that prophylactic or concomitant carotid surgery decreases this rate of complications in asymptomatic patients. 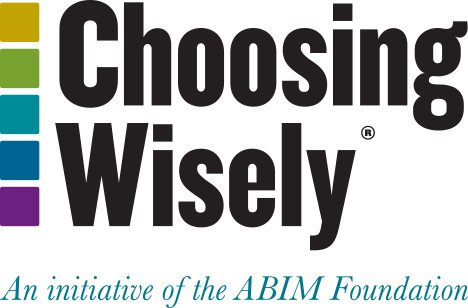 ACC/AHA 2011 guidelines for coronary artery bypass graft surgery indicate carotid artery duplex scanning is reasonable in selected patients who are considered to have high-risk features. However, this was based on a consensus and a low level of evidence. In addition, a recent consensus report from the United Kingdom questioned whether neurologic sequellae developing in cardiac surgery patients with asymptomatic carotid disease are due to the carotid artery disease or rather act as a surrogate for an increased stroke risk from atherosclerotic issues with the aorta. The Northern Manhattan Stroke Study concluded that carotid auscultation had poor sensitivity and positive predictive value for carotid stenosis and so decisions on obtaining carotid duplex studies should be considered based on symptoms or risk factors rather than findings on auscultation. Don’t perform a routine pre-discharge echocardiogram after cardiac valve replacement surgery. Pre-discharge cardiac echocardiography is useful after cardiac valve repair. It provides information regarding the integrity of the repair and allows the opportunity for early identification of problems that may need to be addressed surgically during the index hospitalization. Unlike valve repair, there is a lack of evidence that supports the routine use of cardiac echocardiography pre-discharge after cardiac valve replacement. Scenarios that would justify the use of pre-discharge cardiac echocardiography include: inability to perform intraoperative transesophageal echocardiography, clinical signs and symptoms worrisome for valvular malfunction or infection, or a large pericardial effusion. Patients with suspected or biopsy proven Stage I NSCLC do not require brain imaging prior to definitive care in the absence of neurologic symptoms. The incidence of occult brain metastasis in Stage I lung cancer is low (<3%) and so routine brain imaging results in increased costs, delays in therapy and rarely changes patient management. False-positive studies occur in up to 11% of patients resulting in further invasive testing or incorrect over staging, with potentially tragic effects on treatment decisions and outcomes. Some clinicians perform routine screening by brain magnetic resonance imaging (MRI) or computed tomography (CT) scans to rule out occult brain metastasis in asymptomatic patients prior to surgical resection of early stage lung cancer. This practice of routine screening for occult brain metastases has not been evaluated by a randomized clinical trial and may not be cost-effective or medically necessary. Pooled data from retrospective studies that included a comprehensive clinical evaluation demonstrated that only 3% of patients who have a negative neurologic evaluation present with intracranial metastasis. One study, limited to Stage I patients, reported a prevalence of 1.3%. The joint statement of the American Thoracic Society and the European Respiratory Society did not advocate preoperative imaging of the brain in patients with NSCLC who present without neurologic symptoms, and the current National Comprehensive Cancer Network (NCCN) non-small cell lung cancer guidelines do not recommend preoperative brain imaging for asymptomatic patients with Stage IA non-small cell lung carcinoma. Prior to cardiac surgery, there is no need for pulmonary function testing in the absence of respiratory symptoms. PFTs can be helpful in determining risk in cardiac surgery, but patients with no pulmonary disease are unlikely to benefit and do not justify testing. Symptoms attributed to cardiac disease that are respiratory in nature should be better characterized with PFTs. Risk models for cardiac surgery developed from review of The Society of Thoracic Surgeons Adult Cardiac Surgery Database incorporate a variable for chronic lung disease. Only recently have actual FEV1 and DLCO data been collected in the database. In the absence of respiratory symptoms or suggestive medical history, pulmonary function testing is quite unlikely to change patient management or assist in risk assessment. Although some data are beginning to emerge about preoperative pulmonary rehabilitation prior to cardiac surgery for patients with even mild to moderate obstructive disease, this does not directly extrapolate to asymptomatic patients. Founded in 1964, The Society of Thoracic Surgeons (STS) is an international not-for-profit organization representing more than 6,500 cardiothoracic surgeons, researchers and other health care professionals who are part of the cardiothoracic surgery team. STS members are dedicated to ensuring the best possible outcomes for surgeries of the heart, lung and esophagus, as well as other surgical procedures within the chest. For more information about cardiothoracic surgery procedures, visit www.sts.org/patients. The Society of Thoracic Surgeons (STS) list development process was led by the First Vice-President, and involved input from multiple workforces, including the Workforce on Adult Cardiac and Vascular Surgery, Workforce on General Thoracic Surgery, and Workforce on Evidence Based Surgery, and was staffed by STS’ Director of Quality. The initial 17 recommendations from these Workforces were narrowed down to eight based upon frequency, clinical guidelines and potential impact. STS leadership approved these eight recommendations for presentation to members in an online survey. The results of the survey, as well as research and systematic literature review by the Workforce on Evidence Based Surgery, were presented to the STS Executive Committee, which approved the five final recommendations. Fleisher LA, Beckman JA, Brown KA, Calkins H, Chaikof E, Fleischmann KE, Freeman WK, Froehlich JB, Kasper EK, Kersten JR, Riegel B, Robb JF, Smith SC Jr, Jacobs AK, Adams CD, Anderson JL, Antman EM, Buller CE, Creager MA, Ettinger SM, Faxon DP, Fuster V, Halperin JL, Hiratzka LF, Hunt SA, Lytle BW, Nishimura R, Ornato JP, Page RL, Tarkington LG, Yancy CW. ACC/AHA 2007 guidelines on perioperative cardiovascular evaluation and care for non-cardiac surgery: A report of the American College of Cardiology Foundation/American Heart Association Task Force on Practice Guidelines (Writing Committee to Revise the 2002 Guidelines on Perioperative Cardiovascular Evaluation for Non-cardiac Surgery). Circulation. 2007 Oct 23;116:e418-99. Poldermans D, Bax JJ, Boersma E, De Hert S, Euckhout E, Fowkes G, Gorenek B, Hennerici MG, Iung B, Kelm M, Per Kjeldsen K, Kristensen SD, Lopez-Sendon J, Pelosi P, Philippe F, Pierard L, Ponikowski P, Schmid J-P, Sellevold OFM, Sicari R, Van den Berghe G, Vermassen F. Guidelines for preoperative cardiac risk assessment and perioperative cardiac management in non-cardiac surgery. The task force for preoperative cardiac risk assessment and perioperative cardiac management in non-cardiac surgery of the European Society of Cardiology and endorsed by the European Society of Anaesthesiology. Eur Heart J. 2009;30:2769–812. Brunelli A, Varela G, Salati M, Jimenez MF, Pompili C, Novoa N, Sabbatini A. Recalibration of the revised cardiac risk index in lung resection candidates. Ann Thorac Surg. 2010;90:199–203. Wijeysundera DN, Beattie WS, Elliot RF, Austin PC, Hux JE, Laupacis A. Non-invasive cardiac stress testing before elective major non-cardiac surgery: Population based cohort study. BMJ. 2010;340:b5526. American College of Cardiology Foundation/American Heart Association Task Force on Practice Guidelines. 2011 ACCF/AHA Guideline for Coronary Artery Bypass Graft Surgery. Circulation. 2011;124(23):e652-e735. Stansby G, Macdonald S, Allison R, de Belder M, Brown MM, Dark J, Featherstone R, Flather M, Ford GA, Halliday A, Malik I, Naylor R, Pepper J, Rothwell PM. Asymptomatic carotid disease and cardiac surgery consensus. Angiology. 2011;62:457-460. Tarakji KG, Sabik JF, Bhudia SK, Batizy LH, Blackstone EH. Temporal onset, risk factors, and outcomes associated with stroke after coronary artery bypass grafting. JAMA. 2011;305:381-390. Naylor AR, Bown MJ. Stroke after cardiac surgery and its association with asymptomatic carotid disease: An updated systematic review and meta-analysis. Eur J Vasc Endovasc Surg. 2011;41:607-624. Cournot M, Boccalon H, Cambou JP, Guilloux J, Taraszkiewicz D, Hanaire-Broutin H, Chamontin B, Galinier M, Ferrières J. Accuracy of the screening physical examination to identify subclinical atherosclerosis and peripheral arterial disease in asymptomatic subjects. J Vasc Surg. 2007 Dec;46:1215-21. Ratchford EV, Jin Z, Di Tullio MR, Salameh MJ, Homma S, Gan R, Boden-Albala B, Sacco RL, Rundek T. Carotid bruit for detection of hemodynamically significant carotid stenosis: The Northern Manhattan Study. Neurol Res. 2009;31:748–752. Zoghbi WA, Chambers JB, Dumesnil JG, Foster E, Gottdiener JS, Grayburn PA, Khandheria BK, Levine RA, Marx GR, Miller FA Jr, Nakatani S, Quiñones MA, Rakowski H, Rodriguez LL, Swaminathan M, Waggoner AD, Weissman NJ, Zabalgoitia M. Recommendations for evaluation of prosthetic valves with echocardiography and doppler ultrasound: A report from the American Society of Echocardiography’s Guidelines and Standards Committee and the Task Force on Prosthetic Valves, developed in conjunction with the American College of Cardiology Cardiovascular Imaging Committee, Cardiac Imaging Committee of the American Heart Association, the European Association of Echocardiography, a registered branch of the European Society of Cardiology, the Japanese Society of Echocardiography and the Canadian Society of Echocardiography, endorsed by the American College of CardiAmerican College of Cardiology/American Heart Association Task Force on Practice Guidelines; Society of Cardiovascular Anesthesiologists; Society for Cardiovascular Angiography and Interventions; Society of Thoracic Surgeons. ACC/AHA 2006 guidelines for the management of patients with valvular heart disease: A report of the American College of Cardiology/American Heart Association Task Force on Practice Guidelines (writing committee to revise the 1998 Guidelines for the Management of Patients With Valvular Heart Disease): Developed in collaboration with the Society of Cardiovascular Anesthesiologists: Endorsed by the Society for Cardiovascular Angiography and Interventions and the Society of Thoracic Surgeons. Circulation. 2006 Aug 1;114(5):e84-231. ology Foundation, American Heart Association, European Association of Echocardiography, a registered branch of the European Society of Cardiology, the Japanese Society of Echocardiography, and Canadian Society of Echocardiography. J Am Soc Echocardiogr. 2009 Sep;22(9):975-1014. American College of Cardiology/American Heart Association Task Force on Practice Guidelines; Society of Cardiovascular Anesthesiologists; Society for Cardiovascular Angiography and Interventions; Society of Thoracic Surgeons. ACC/AHA 2006 guidelines for the management of patients with valvular heart disease: A report of the American College of Cardiology/American Heart Association Task Force on Practice Guidelines (writing committee to revise the 1998 Guidelines for the Management of Patients With Valvular Heart Disease): Developed in collaboration with the Society of Cardiovascular Anesthesiologists: Endorsed by the Society for Cardiovascular Angiography and Interventions and the Society of Thoracic Surgeons. Circulation. 2006 Aug 1;114(5):e84-231. Bonow RO, Carabello BA, Chatterjee K, de Leon AC Jr, Faxon DP, Freed MD, Gaasch WH, Lytle BW, Nishimura RA, O’Gara PT, O’Rourke RA, Otto CM, Shah PM, Shanewise JS. 2008 focused update incorporated into the ACC/AHA 2006 guidelines for the management of patients with valvular heart disease: a report of the American College of Cardiology/American Heart Association Task Force on Practice Guidelines (Writing Committee to Revise the 1998 Guidelines for the Management of Patients With Valvular Heart Disease): Endorsed by the Society of Cardiovascular Anesthesiologists, Society for Cardiovascular Angiography and Interventions, and Society of Thoracic Surgeons. Circulation. 2008 Oct 7;118(15):e523-661. American College of Cardiology Foundation Appropriate Use Criteria Task Force; American Society of Echocardiography; American Heart Association; American Society of Nuclear Cardiology; Heart Failure Society of America; Heart Rhythm Society; Society for Cardiovascular Angiography and Interventions; Society of Critical Care Medicine; Society of Cardiovascular Computed Tomography; Society for Cardiovascular Magnetic Resonance; American College of Chest Physicians. ACCF/ASE/AHA/ ASNC/HFSA/HRS/SCAI/SCCM/SCCT/SCMR 2011 Appropriate Use Criteria for Echocardiography. A Report of the American College of Cardiology Foundation Appropriate Use Criteria Task Force, American Society of Echocardiography, American Heart Association, American Society of Nuclear Cardiology, Heart Failure Society of America, Heart Rhythm Society, Society for Cardiovascular Angiography and Interventions, Society of Critical Care Medicine, Society of Cardiovascular Computed Tomography, Society for Cardiovascular Magnetic Resonance American College of Chest Physicians. J Am Soc Echocardiogr. 2011 Mar;24(3):229-267. Silvestri GA, Gould MK, Margolis ML, Tanoue LT, McCrory D, Toloza E, Detterbeck F. Noninvasive staging of non-small cell lung cancer. ACCP Evidenced-Based Clinical Practice Guidelines (2nd Edition). Chest. 2007;132(3suppl):178S-201S. Tanaka K, Kubota K, Kodama T, Nagai K, Nishiwaki Y. Extrathoracic staging is not necessary for non-small-cell lung cancer with clinical stage T1–2 N0. Ann Thorac Surg. 1999 Sep;68(3):1039-1042. American Thoracic Society and European Respiratory Society Consensus Report. Pretreatment evaluation of non-small cell lung cancer. Am J Respir Crit Care Med 1997;156:320-332. Toloza EM. Harpole L, and McCory DC. Noninvasive staging of non-small cell lung cancer: A review of the current evidence. Chest. 2003;123;(1 Sppl):137S-146S. National Comprehensive Cancer Network. National Comprehensive Cancer Network clinical practice guidelines in oncology (NCCN Guidelines®): Non-small cell lung cancer. Fort Washington (PA): NCCN;2012. Colice GL, Birkmeyer JD, Black WC, Littenberg B, Silvestri G. Cost-effectiveness of head CT in patients with lung cancer without clinical evidence of metastases. Chest.1995;108(5):1264-1271. Shahian DM, O’Brien SM, Filardo G, Ferraris VA, Haan CK, Rich JB, Normand SL, DeLong ER, Shewan CM, Dokholyan RS, Peterson ED, Edwards FH, Anderson RP. The society of thoracic surgeons 2008 cardiac surgery risk models: Part 1–coronary artery bypass grafting surgery. Ann Thorac Surg. 2009 Jul;88:S2-22. O’Brien SM, Shahian DM, Filardo G, Ferraris VA, Haan CK, Rich JB, Normand SL, DeLong ER, Shewan CM, Dokholyan RS, Peterson ED, Edwards FH, Anderson RP. The society of thoracic surgeons 2008 cardiac surgery risk models: Part 2–isolated valve surgery. Ann Thorac Surg. 2009 Jul;88:S23-42. Ried M, Unger P, Puehler T, Haneya A, Schmid C, Diez C. Mild-to-moderate copd as a risk factor for increased 30-day mortality in cardiac surgery. Thorac Cardiovasc Surg. 2010 Oct;58:387-391. Adabag AS, Wassif HS, Rice K, Mithani S, Johnson D, Bonawitz-Conlin J, Ward HB, McFalls EO, Kuskowski MA, Kelly RF. Preoperative pulmonary function and mortality after cardiac surgery. Am Heart J. 2010 Apr;159(4):691-697.